Day Three — No really, it’s a scooter obstacle course. After the thrill of blocking had run its sharp half-life through my system, I found myself once more at BlueCat Motors. The ride went great. No major incidents, nobody that we know of got lost or separated. Nobody wrecked. Pretty much everybody had a great time. There is really only one thing about RMB that I could complain about. When there’s an activity, such as a meal, it needs to really get going right away. There were two activities at BlueCat Motors — the “pig roast”, and the gymkhana. In both cases, neither got going with any sort of expediency. That ended up being a real detriment to both events. People didn’t know when food was happening, and it actually interrupted the start of the gymkhana. And once the gymkhana eventually got rolling again, people had pretty much lost interest if they hadn’t up and completely left. Which is too bad because it was pretty darn entertaining. 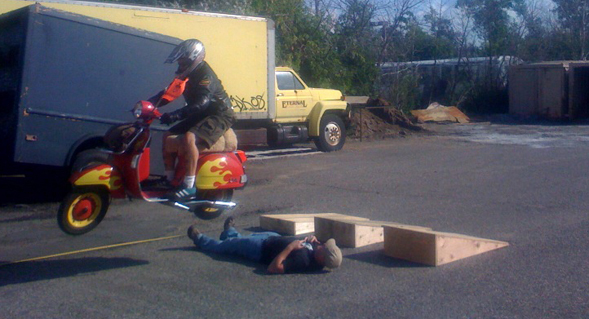 A scooter gymkhana (a word which has its roots in equestrian sports) is essentially an obstacle course you run on your scooter. This was easily my favorite part of the rally last year. The real die-hards, the real gear heads all mount up and take on the course. Best time wins and time is added for putting your foot down or skipping an obstacle. The main gymkhana course this year consisted of a distance jump, a see-saw, water bottle slalom, a set of small consecutive ramps, the “ring of fire”, and finally a water box obstacle. What was probably most disappointing about the gymkhana this year was how really very few people participated. That, and my favorite obstacle got broken before the show really got started. Last year, the water box obstacle was the really intimidating bit of the course. It’s essentially an 18″ deep box, six foot by eight foot, and half full of water with a ramp leading up to it. There’s a safe “high road” about a foot wide along one edge where you can balance and ride your way across without going in the water. This path incurs a small time penalty. To do the obstacle correctly, you must actually drop into the water and ride a ramp inside the box back out the other side — all without falling over. Last year most riders were able to make it through the obstacle without much incident. Then there came Zack on his big Kymco. He managed to hit the entry ramp just right so that his scooter hopped seemingly straight up and landed vertically inside the obstacle wedged between the back and the ramp, his rear wheel spitting water everywhere in a giant rooster tail. His bike was fine and they got him out of there no problem. But it scared the next several riders from venturing into the wet and proper part of the obstacle. That’s when they started jumping it. It was awesome! Vintage Vespas, small pseudo off-road scooters, and anybody else with the nerve began jumping the box completely and getting a time bonus for their fortitude. Apparently, I’m not the only one who remembered that. No sooner was the water box set up this year and full of water were people jumping over it on their Stellas. One unfortunate miss jump knocked the back wall out of the box, spilling about 50 gallons of water into the parking lot. Thankfully the rider didn’t eat it when his back wheel grabbed that box wall, but the obstacle was pretty much done. It ultimately, at least I feel, deflated the whole gymkhana. That and how the damn “ring of fire” wouldn’t stay lit. Geez. The gymkhana does involve more than just the obstacle course. There’s also a tractor pull, where a scooter pulls a person in a wooden sled. Last year this was done in a giant parking lot. This year the whole event was held in a much smaller, more narrow area out behind BlueCat. This worried me. Last year a rider turned sharply and nearly drug the sled and it’s passenger into a concrete light pole base. People don’t realize how the rope will whip that sled out in the opposite direction if they deviate from a straight line drag path. So it was inevitable that Lora, brave soul that she is, was dragged very nearly into disaster by some woman on a pink Stella who would listen to neither instruction nor reason. Thankfully Lora was wearing full riding gear. The best part about the tractor pull is that with just wooden skis underneath, the rig left this great hot sawdust smell every time it went by. The two final events were the slow race and the paintball joust. The slow race is an anti-race in the sense that it’s the last scooter across the finish line that wins, not the first. But the catch is that you can’t put your feet down at any point during the race. So there two riders are, twitching their bikes left and right, trying not to fall over, but also trying to make as little forward progress as possible. It’s an absolute blast to watch. Riders raced two-rider heats with the winner advancing. Two classes, one for automatic bikes, one for shifters, whittled down the field quickly. I hopped on the Blur and slow-raced Lora, only to tip and have to put my foot down within about three seconds of starting. Fail. As for paint ball joust. No I’m not making that up. Two riders ride toward each other armed with pump-action paintball guns and the most hits win! I didn’t actually stick around for this bit, as I was exhausted after blocking the big ride and then sitting ’round in the sun and heat for three hours. So for all I know, it didn’t actually happen. I do remember it being terribly entertaining last year, however.